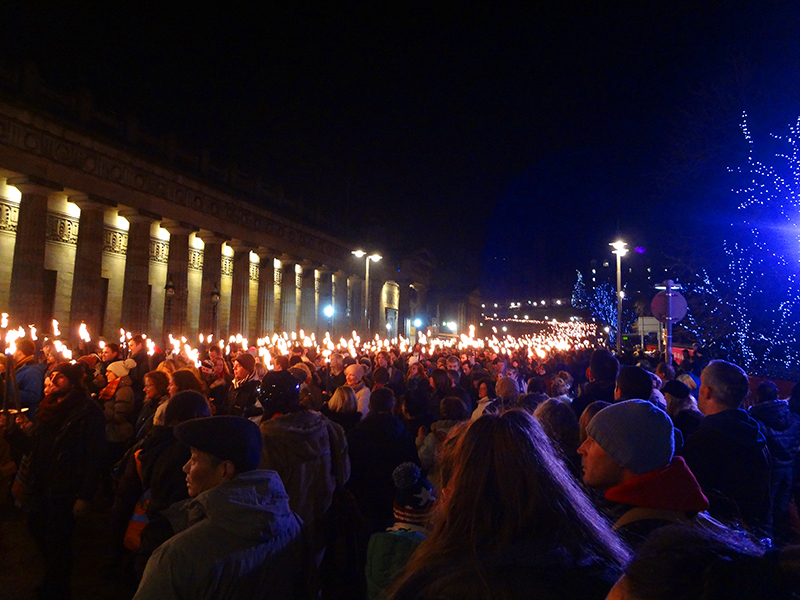 I’ve never lived anywhere that celebrates the New Year over three days, but that’s the case here in Edinburgh. 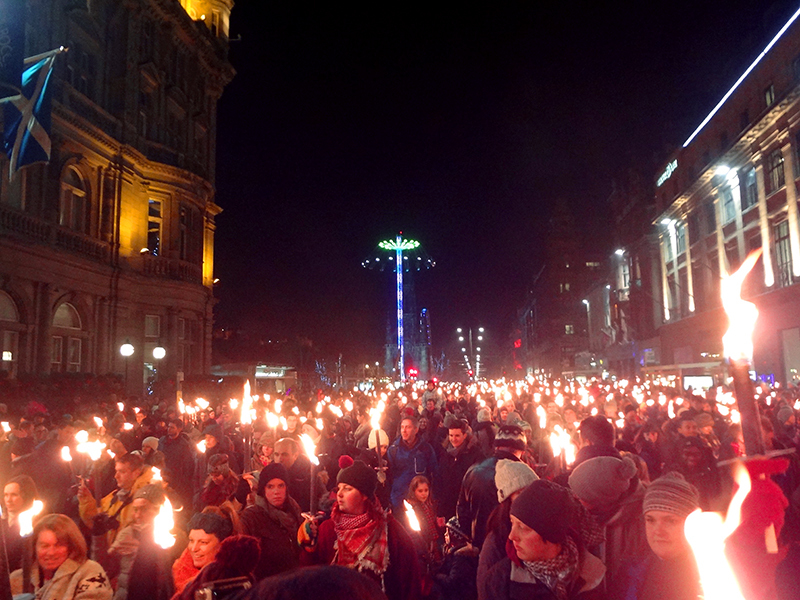 The festivities kicked off last night with a torchlight procession that attracted 35,000 people who carried long wax torches from the medieval part of the city down the Mound to Princes Street. Amazingly, no one appeared to get burned and nothing other than wax and paper went up in flames. 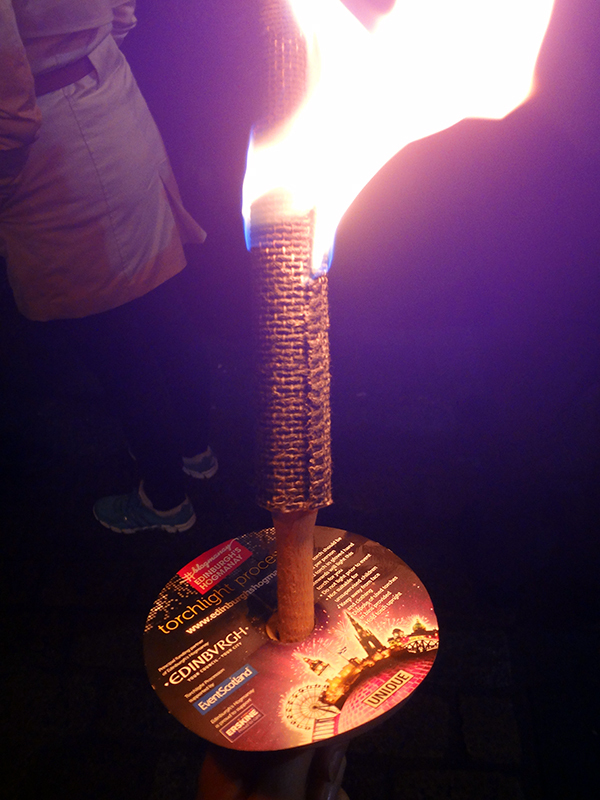 Which is quite something for what was basically a city-wide river of fire shepherded by Vikings. Initially my companion and I were spectators, but some departing revelers gifted us with their extinguished torches. From the curb I hailed a stranger to light my torch, and with that sharing of flame I stepped into the flow. Everyone looks beautiful in firelight, and cheerful. No doubt part of that was because of the clear and not-too-cold weather, which in Scotland at New Year’s is indeed a gift. The best part of the night for me was seeing the faces around me lit with love, joy, and companionship. At my farm I lived a long time in isolation, and to see and be part of such collective emotion is powerful and affecting. 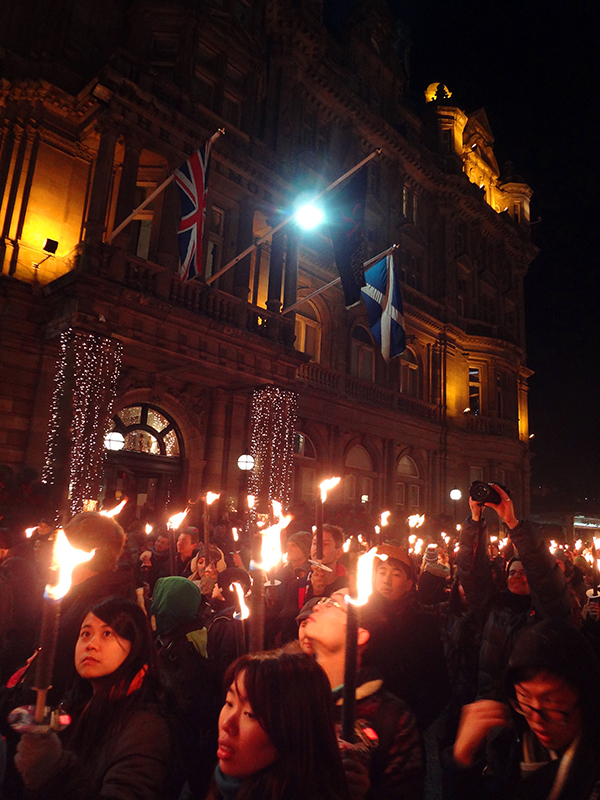 In many ways moving to Scotland was a personal fight to regain connection with other people, and carrying a flame in this procession became a very literal manifestation of that intention. 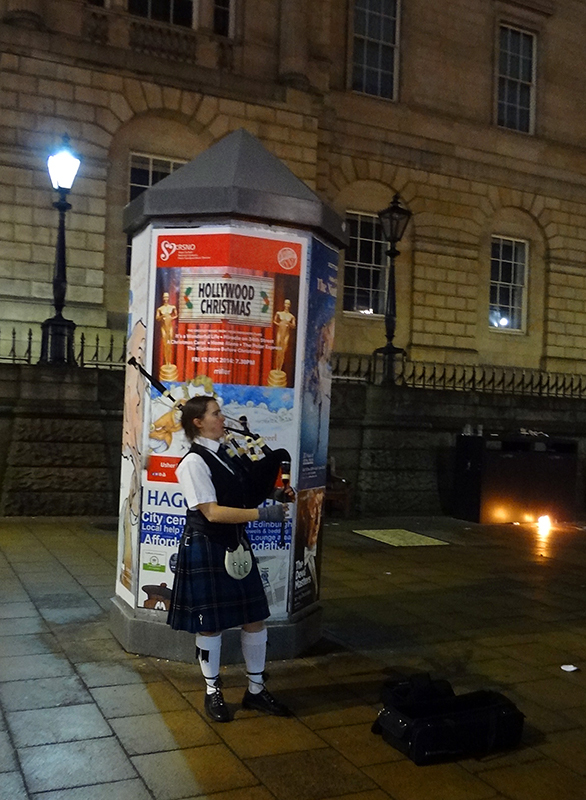 Of course, it wouldn’t be Scotland without a bagpiper in a kilt. The evening ended with fireworks on Calton Hill, which we watched from a sea of torch-bearing processioners. This town shoots off fireworks without hardly any excuse, and ever since October there has been a marked increase in the festivals and fire-bearing festivities. It appears to be an active rebellion against the winter days that start to dim around three in the afternoon, and further proof that a Pagan heart still beats in this ancient land. I love it, the mix of old and new, the smearing of religion into custom into celebration and back again until everyone is just walking together toward a sky full of wonder. I’m headed out now for even more fireworks, but I wanted to wish all of you a very happy new year. If there was ever a year of radical change in my life it was 2014, and though it certainly wasn’t easy it was exactly what I needed. I hope that 2015 brings good health, inspiration, joy and wonderful new possibilities, for all of us. You are currently reading Hogmanay at Bonafide Farm.